I’m in a rush so need to be brief as I’m getting ready to demonstrate some of the lovely recipes from my WI Cookbook this Saturday (May 2nd) at Penshurst Farmers Market. The weather is promising to be suitably springlike so I’m channelling my thermals for freezing winds and showers and am preparing a fairly hearty soup to warm up visitors but, of course, it’s the WI so there will be plenty of historic cake too. And I’m planning to flambe some Crepes Suzette as a tribute to the Sixties. I’ll be signing copies of both the WI Cookbook and my other book Back in Time for Dinner and revealing a few stories behind researching and working on these two wonderful projects. So come along for a chat and a piece of cake…. And make sure you read on to work out just what to buy as you wander around the marketwhen you do. Longer days with some warm spring sunshine means May is always an exciting month at the Farmers’ market, as we start to see the first signs of the bounty of produce that will be with us in the coming months. Best of all there is wonderful English asparagus, one of the great treats of the season. A cool March and early April has kept the spears waiting in the ground but they are pushing through the earth now ready for harvesting. And it looks like it’s going to be a bumper harvest. So when you find the first spears available, buy them! 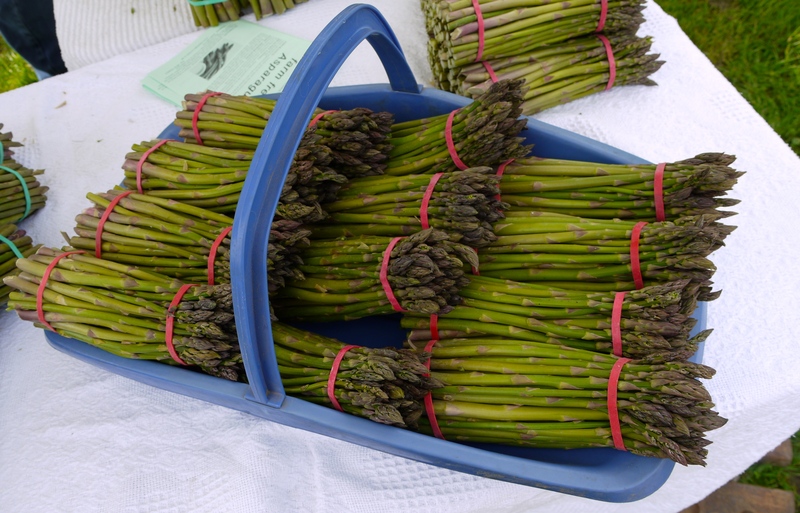 Asparagus is at its sublime best when picked and cooked within hours, something easily achievable when bought locally at the market, unlike the supermarket version which may be several days old and have lost both the distinctive sweetness and tender texture as a result. Make the most of the delicate flavour by serving simply steamed with melted butter or hollandaise, or toss with crumbled local goat’s cheese, some toasted pine nuts and a simple olive oil and lemon vinaigrette. Or try the luxurious chicken recipe below. Other spring vegetables are just starting to appear after the cold of the winter. Look out for are tender little early English new potatoes giving the Jerseys a run for their money. Leaves such as spinach, watercress, rocket and lettuces can now be found sitting alongside the last of this year’s main vegetable crop of purple sprouting broccoli, spring cabbage, cauliflower, spring greens, spring onions and radishes. Radishes, spring onions and samphire show that lighter eating is now an easy choice for the cook. The wealth of summer berries are still ahead of us but do continue to make the most of green outdoor rhubarb this month in crumbles, pies and fools. Or try making your own rhubarb jams and chutneys – the tart flavour of the fruit is ideal used this way, particularly if you add ginger as a flavouring. By the end of the month the earliest gooseberries should be available ready to pair up with their perfect partner – elderflowers. Just add a head or two of creamy white flowers (pick away from roads or sprayed fields and shake to remove bugs) to the gooseberries as they cook and lift out before serving. Wild sea trout is one of the season’s great treats – smaller fish make a lovely meal for one. Lemon sole, cod, halibut and sea bass are all good at this time of year and shellfish fans should keep an eye out for razor clams and cockles. For meat eaters spring lamb will start to appear during the month – lambs are sold the year of their birth and the early season lamb is tender and fine flavoured. Look out for salt marsh lamb coming in at the end of the month, with its juicy meat and distinctive flavour. Roast and serve simply with new potatoes cooked in their skins with a sprig or two of fresh mint and samphire to enhance the salty tang to the flesh. To cook samphire just rinse and boil in water briefly – don’t add any more salt – then toss in a little local butter. The texture should be still crisp. Local reared beef and pork will be at their most succulent as the grazing starts to green up. Melt the butter in a medium heavy-based casserole, add the chicken stripsand brown lightly on all sides over a medium high heat. Remove from the pan with a slotted spoon and set aside. Add the onion to the pan and cook over a low heat for several minutes until lightly coloured. Return the chicken and any juices to the pan. Sprinkle over the flour, stir and let it cook for a minute. Increase the heat and add the white wine, stirring. Gradually add the stock and lemon juice and bring to the boil, stirring, then lower the heat and simmer gently for about 5 minutes until the chicken is nearly cooked through. Add the asparagus and seasoning, pushing the asparagus under the surface of the liquid, and continue simmering for about 5 minutes, until the asparagus is just tender. Stir in the cream, lemon rind and chopped herbs and heat through back to simmering point. Check the seasoning and serve with steamed rice or new potatoes. 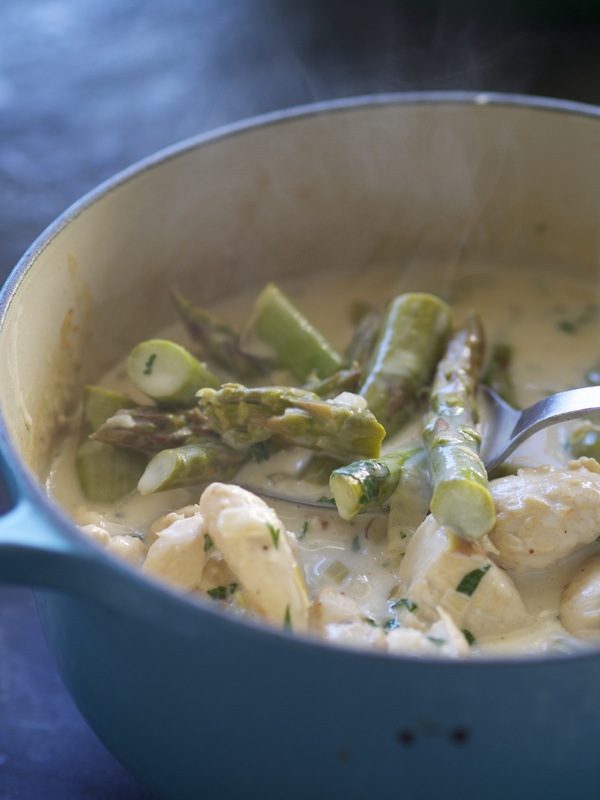 This entry was posted in Farmers Market, In season, Recipes, The WI and tagged Asparagus, aspargus recipe, Back in Time for Dinner, Bank holiday cooking, farmers market, in season, Penshurst farmers market, The WI cookbook: The first 100 years. Bookmark the permalink.